This is the cover card for Premium Pack Vol.4. This cars has a Link/retrained counterpart: Darkness Metal, the Dark Steel Dragon. 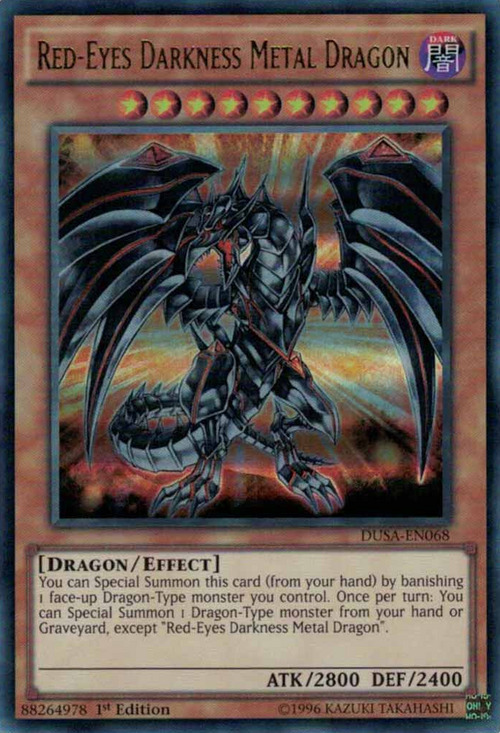 As Red-Eyes Black Metal Dragon is a metalized version of Red-Eyes Black Dragon, this card is a metalized version of Red-Eyes Darkness Dragon and as such has the same ATK and DEF as Black Metal Dragon, which ties them for having the highest original ATK and DEF of all Red-Eyes monsters. Unlike Black Metal Dragon, this monster is a Dragon instead of a Machine. Also unlike other Red-Eyes monsters, the printed version of this card's only direct relation to them is it's name and image (since the requirement of a Red-Eyes to Summon it was completely removed, rather than altered). This card has the highest Level of all Red-Eyes monsters. In the anime, the Summoning procedure of this card is based on that of Red-Eyes Black Metal Dragon, since it requires Metal Plus to be equipped to Red-Eyes Darkness Dragon (with Metalmorph and Metal Plus both having Magic-Reflection Armor in their Japanese names). This is the first Red-Eyes monster to become Limited. This card along with Dandylion were the 2009 Shonen Jump subscription promos. Together, they were released in the Absolute Powerforce: Special Edition. The effect which Special Summons a Dragon-Type monster does not target. "Red-Eyes Darkness Metal Dragon" and "Dark Simorgh" are Normal Summon Monsters, so they can be Tribute Summoned from the hand. They may also be Special Summoned from the Graveyard with another card effect, even if the monster is sent directly to the Graveyard from the hand or Deck. : Are "Dark Simorgh" and "Red-Eyes Darkness Metal Dragon" Normal Summon Monsters? You can remove from play a Dragon-Type Token Monster from the field to Special Summon "Red-Eyes Darkness Metal Dragon". : Can a Token Monster be used when Special Summoning a monster like "The Atmosphere" or "Red-Eyes Darkness Metal Dragon"?